Ayurveda is the medical side of yoga. It’s India’s traditional natural healing system, which has been practiced for over 5,000 years. Ayurvedic resorts have become popular destinations for relaxation and rejuvenation in India, while ayurvedic hospitals cater to people seeking ayurvedic treatment for more serious health problems. Ayurvedic medicine is particularly effective for metabolic, stress-related, and chronic conditions. Treatments are also very helpful in relieving the effects of surgery and debilitating treatments such as chemotherapy. Other popular uses of Ayurveda include those for general rejuvenation and beauty care. Ayurveda is a pranic system of medicine, which works to balance the body’s life energies, referred to as the doshas. This is achieved by diet, different types of massage, pouring herbal liquid onto the body, and covering the body with herbal leaves and powders. You’ll be assessed by a qualified doctor and a treatment program tailor-made to address the root of your problem. Generally, at least a couple of weeks are needed to complete a full course of Ayurvedic treatment. However, it’s also possible to get simple renewal treatments, such as Ayurvedic massage, by themselves. The rainy season, during the monsoon from June to September, is an ideal time for Ayurvedic treatment because the atmosphere remains cool, moist, and dust free. This helps the body’s pores to open up, making it most receptive to herbal oils and therapy. Most places that offer Ayurvedic treatment are located in the southern state of Kerala, due to the climate and abundant supply of medicinal plants and herbs there. You’ll also find quite a few Ayurvedic centers in Goa and Karnataka. Ayurvedic treatments are available both at Ayurvedic hospitals and Ayurvedic resorts, as well as wellness centers and most five-star hotels in these states. Another innovative option is to book an Ayurvedic houseboat and explore the picturesque Kerala backwaters while receiving treatment. Ayurvedic hospitals are the cheapest option, and it’s possible to receive treatment at an Ayurvedic hospital for around $1,000 per month excluding accommodation. Alternatively, the minimum price charged by resorts for Ayurvedic treatment is between $60-100 per day. Seven-day Ayurvedic houseboat packages are available from around $1,500 for two people. Alternatively, the whole houseboat (which sleeps 8 people) can be hired for $6,600, for seven days. You’ll find that there are two main types of Ayurvedic treatment on offer in India: general rejuvenation treatments catering to tourists and given by resorts in tourist areas, and intensive medical treatments administered by centers in geographic locations with the most suitable climates. Resorts are fine for anyone just wanting to get some pampering, a massage, or an overall feel for Ayurveda. However, those who are serious about receiving quality Ayurvedic treatment for medical reasons should go to a proper hospital. Kerala Tourism, one of the most popular travel websites in India, has introduced the "Green Leaf" and "Olive Leaf" grading for Ayurvedic institutions in order to ensure quality service. "Green Leaf" is given to those Ayurvedic centers that provide five-star facilities while "Olive Leaf" is for the three-star category. These classifications ensure the credibility of service providers and the quality. Kerala Tourism also offers Age Halt Ayurvedic packages, with seamless treatment under medical supervision across a number of its resorts, for those who want to combine Ayurveda with visiting some of the state's top destinations. Some of the top places to receive authentic Ayurvedic treatment in India are the Ayurvedic hospitals managed by the Arya Vaidya Sala charitable institution. The main one is in Kottakkal, in Kerala. There are others in Kochi, Delhi, and Kolkata (Calcutta). All types of accommodations are provided, from budget to luxury. Be sure to book well in advance though. If it's full, you can also try the Padinharkkara Ayurveda Hospital and Research Center. It's a budget place in the Palakkad district of Kerala. The Hindustan Kalari Sangam Ayurveda Hospital, in Kozhikode (Calicut), Kerala, is a renowned specialty center for orthopedic and sports medicine ailments. It has another branch near Auroville, Pondicherry. Top Kerala Ayurvedic resorts are well managed and have an excellent range of properly administered treatments. In Goa, the Ayurvedic Natural Health Centre near Calangute is good. 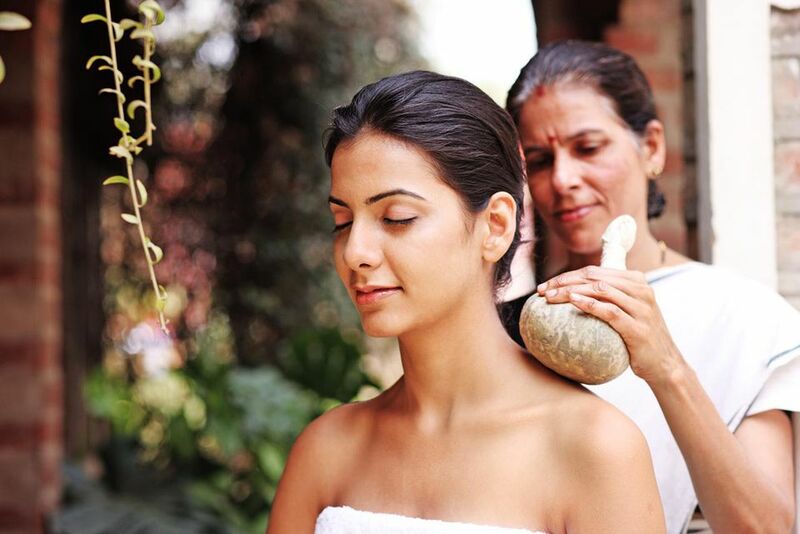 In Karnataka, try Ayurvedagram or the Indus Valley Ayurvedic Centre (IVAC). Or, if you're on a budget Doctor Shivkumar at Hitayu Ayurveda and Yoga Center in Udupi, Karnataka, is recommended. You’ll find that many of the places offer attractive discounts for stays during the monsoon season. While Ayurveda is more prominent in the south due to the climate, there are a few renowned resorts in the north around Rishikesh that offer Ayurveda. One of the best is Ananda In the Himalayas, not far from Rishikesh. A new boutique hotel in Rishikesh, Dewa Retreat has a wellness center that offers traditional Ayurvedic treatments. Sanskriti, riverside in Rishikesh, is a less costly option and it serves Ayurvedic food as well. Ayurveda Bhawan and Hemadri Ayurveda Center are other decent options in Rishikesh, particularly for panchakarma. Vedic Ayurved also gives some of the best Ayurvedic treatments, including massages, in Rishikesh. For delicious and healthy Ayurvedic cuisine in Rishikesh, don't miss visiting (or staying at) Ayurpak! If your interest in Ayurveda is more in-depth, then head to nearby Haridwar, as many roots and shrubs that are grown in the Himalayas are readily available there. The area is renowned for its Ayurvedic colleges and hospitals as well as Baba Ramdev's Patanjali Yogpreeth, which gives Ayurvedic treatments. You'll also find plenty of Ayurvedic pharmacies in Haridwar, such as Swadeshi. In Almora in Uttarakhand, AyurVAID Kalmatia is excellent. What Is a Body Polish, and Why Do You Need One? What's an IPL Skin Treatment and Should You Get One?